We have two important historical facts which confirm the founding of the Church of the East in the Southern region of Beth Nahrain (Mesopotamia), in Babylon during the early years of the spread of Christianity. When reading this plainly worded passage from St. Peter’s first letter, the reader is entitled to conclude that St. Peter wrote his letter from Babylon. However, a number of biblical scholars and academics say that this interpretation of this biblical passage is incorrect and is no more than a popular tradition that has had its roots and has evolved in the teachings of the Church of the East over the past two thousand years. They further add that the interpretation is not based on a historical fact, and that St. Peter went straight from Antioch to Rome where a few years later he received the crown of martyrdom between the years of 64 and 68 AD, and that he at no time went to the Church of the East territory in Bet Nahrain. These interpreters of the Bible say that the word ‘Babylon’, which St. Peter used in this particular passage of his letter, referred symbolically to the city of Rome, a city which at the time was known for its evil and ungodliness, just as the ancient city of Babylon had been depicted in the Old Testament. There are many who view this interpretation as strange and somewhat fanciful, because St. Peter clearly wrote in his letter: “The chosen church which is at Babylon…” which clearly specifies the geographical location of the Church from where the greetings were conveyed. Even if we, for one moment, think that St. Peter did not physically go to our forefathers’ homeland in Bet Nahrain, it is not beyond the realm of probability that he may have received a letter from a Church leader or from a faithful member of the Church of East residing in Babylon in which the sender would have asked St. Peter to convey their greetings to their brothers in Christianity who resided in various provinces of the Roman Empire which at that time were located in what is now modern Turkey. The second proof relates to Mar ( ܡܵܪܝ – Syriac for ‘my lord’, but generally translated into English as ‘Saint’) Mari’s visit, during the second half of the first century of Christianity, to the city of Seleucia (Sliq or Saliq – ܣܠܝܼܩ\ܣܵܠܝܼܩ in Syriac) situated on the Western side of the River Tigris in Southern Bet Nahrain. Mar Mari was one of the disciples of Mar Addai (also known as St. Thaddeus). It was Mar Addai who sent Mar Mari from Edessa to Bet Nahrain. The book of Acts of Mar Mari teaches us that Mar Mari spent some time in the Kingdom of Urhai (Edessa). 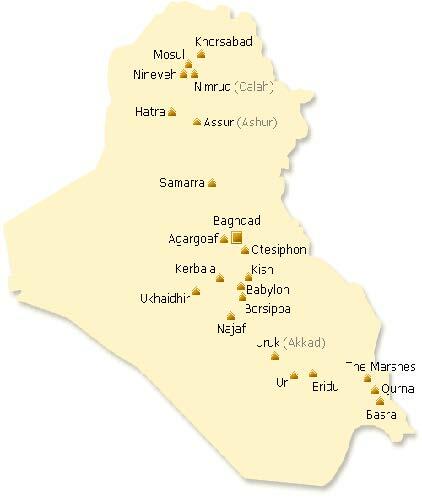 He left Urhai, on instructions from his teacher Mar Addai, and headed to Nisibin and then on to Adiabene (Arbil of present day). He continued his journey southwards through Beth Garmai (situated between the Little Zab and Diyala rivers and centred around Karkha Beth Slokh which is Kirkuk of the present time) until he and his companions reached the city of Saliq on the River Tigris in Babylon. At the beginning Mar Mari and his companions did not get a friendly reception from the pagan citizens of the city. A group of the citizens crossed the River Tigris and went straight to King Artabanus IV of Parthia’s palace in Qtispon (or Ctesiphon) and complained about these strange intruders in their midst. King Artabanus wanted to know how true was the new faith which Mar Mari and his companions were preaching to his citizens. The King asked Mar Mari to cure his sister who was suffering from the dreadful leprosy. Mar Mari cured the King’s sister. The King was duly impressed with this and other miracles that Mar Mari performed in the locality. The King rewarded Mar Mari with a piece of land in the area called Kokheh which was located to west of his capital Qtispon. This piece of land already had a pagan temple on it which Mar Mari duly converted into a small Church and which became known as the Church of Kokheh throughout the history of the Church of the East. The word ‘Kokheh’ – ܟܘܼܟ݂ܹ̈ܐ – is the plural for ‘kokha’ ܟܘܼܟ݂ܵܐwhich means a hut normally built from clay or cane or from twigs. That area contained a number of huts where the King’s servants and farmers lived. The small Church of Kokheh was enlarged and modified as years went by, especially during the reign of Catholicos Mar Awa the Great ܡܵܪܝ ܐܵܒ݂ܵܐ ܪܲܒܵܐ (552 – 540). Until about the end of the first century AD, Kokheh was located on the eastern side of the River Tigris, not far from Qtispon. However, a change in the course of the river occurred between the years 79 and 117 AD which altered the flow of the river. The river changed its course eastwards for a short distance and ended up cutting off the suburb of Kokheh from the city of Qtispon. This meant that Kokheh was now located on the Western side of the river, and all that now separated it from the city of Saliq was the dried up bed of the river before it shifted its course eastwards. When the Sassanid King Ardashir I (224 – 241 AD) defeated the Parthian rulers in the year 224 and adopted the city of Qtispon as his capital, he respected the Christian followers of the Church of the East which had spread in that region. He included Beth Kokheh as a part or suburb of his capital Qtispon. He at the same time renewed and rebuilt Saliq which had been destroyed by the Romans in 165 AD and changed its name to ‘Weh Ardashir’ which means Ardashir’s good deed. The cities of Saliq and Qtispon were joined together by two rivers. These two historical cities, together with a few other cities in the neighbourhood, were later given the collective name of Al Mada’in المدائن (Cities). Al Mada’in is the plural of المدينة (city). The Church of the East was not only spread in the Saliq Qtispon region during those early centuries of Christian era. History teaches us that at the beginning of the third century AD the Church of the East had also centres in Adiabene (Arbel of present day), and in Karkha D’Bet Sloq (Kirkuk of the present day), and in Nisibin and also in Beth Lappat (presently located in Khuzestan in South/West Iran). There was only one Christian Church in the early centuries of Christianity. The Church of the East used to receive guidance from the Church in Antioch or Antakya which was located within the sphere of the Roman Empire. All of the bishops of the Church of the East used to be consecrated by the Patriarch in Antioch. However, communications between the Church of the East, which was spread to the east of the Roman Empire and within the boundaries of the Persian Empire (ruled by the Parthians and later by the Sassanids), and the Church Fathers in Antioch, which fell within the boundaries of the Roman Empire, were at times difficult and dangerous due to the political situation of that era as well as the wars and disagreements that happening between the Roman and Persian rulers. This situation created the necessity for the Church of the East to be given a certain amount of autonomy. Thus, by the end of the third century the bishop of the Church of the East in Saliq Qtispon, or Bet Kokheh, was granted the title Catholicos (الجاثليق in Arabic which means general, universal) and also the administrative power over the Church affairs in the East as well as the power to consecrate bishops. The close ties that existed between the Church of the East and the Christian Church in the Roman Empire are well recorded in The Concise Collection of Synodical Canons which was compiled in early 14th century by Mar Audisho Bar Brikha, Metropolitan of the Church of the East, diocese of Nisibin and Armenia, who died in 1318. We read on page 22 of the handwritten Classical Syriac edition of the book King Constantine, the Roman Emperor, sent a letter in about 324 AD to all of the Bishops in the world inviting them to a Council which was to be held in Nicea (ܢܝܼܩܝܼܵܐ in Syriac) in the region of Betonia. The Council of Nicea did convene in 325 AD and between 270 and 318 bishops were able to attend. Only five of the attendees came from the Western regions. The rest came from the lands that were situated to the east of the Mediterranean Sea. The first attempt at establishing the Church of the East as independent from the Church in the West happened in the Synod of Mar Iskhaq (Isaac) Catholicos which was convened in the Church of Kokheh in Saliq Qtispon in 410 AD. The Synod was organised with the help of Bishop Marutha of Maipherqat who brought with him letters from the Church fathers in the West. One of the letters was for Mar Iskhaq Catholicos and another letter was for the Persian King Yazdegerd I. Mar Marutha and Mar Iskhaq went to see the King to seek royal permission to invite all of the bishops of the Church of the East in Beth Nahrain and Persia to attend a Synod in the Church at Beth Kokheh in Saliq Qtispon. Mar Marutha was a skilled physician and had managed to gain the King’s favour through medical services he had provided to the King. The King gave his permission to go ahead and convene the Synod. Forty bishops of the Church of the East attended the first such Synod held in the East. Mar Marutha, the ambassador of the Church in the West, was also present at the Synod which became known as the Synod of Mar Iskhaq. A set of canons, which included a number which Mar Marutha brought with him from the Western fathers, were enacted by the Synod. It was also at this Synod where the creed of Nicea was adopted by the Church of the East. Shortly after the Church of the East gained its independence and autonomy, the Church began sending missions to spread the message of Christianity in the various regions in the Persian Empire and in Central Asia and China, to the Gulf region, Yemen and various corners of the Arabian Peninsula. Beth Nahrain fell under the rule of Arab Muslims after the battle of Al Qadesiya which was fought in the year 636 between the Arab Muslim army and the Sassanid Persian army. Following this historical battle, Beth Nahrain was governed by the Umayyad Caliphate from the city of Damascus in Syria till the year 750 when the Abbasid dynasty of caliphs took over and moved the centre of power to Iraq. The Abbasid kings set up their initial capital in Kupha until their new capital of Baghdad was built in 762. The Church of the East continued to prosper and expand during the first three centuries of Islam, even though the number of its followers continued to drop as a result of the harsh rules enacted for non-Muslims which consequently forced many Christians to convert to Islam. For example, Mar Temateous I (Timothy) who occupied the Patriarchal See of the Church of the East for 43 years (from 780 to 823) worked under five different caliphs and maintained cordial relations with each one of them. During his Patriarchate the Church of the East had 230 dioceses and 27 Metropolitans (Archbishops), including a new bishop for Yemen. The name of the Church of Beth Kokheh is mentioned many times in the history of the Church of the East. The Church was the main centre for the Catholicos of the Church who was later given the title of Patriarch. In the year 544 Mar Awa Gabbarah (the Great) decreed that the consecration of a Catholicos would not be legitimate unless the consecrations ceremonies were conducted in the Church of Beth Kokheh. As mentioned earlier in this paper, the Church was built by Mar Mari in about the year 100 AD. It was renovated and enlarged and rebuilt several times over the years and centuries. The Church remained the main centre of the See of the Catholicos, and later of the Patriarch, until the year 780 when Mar Temateous I moved the Patriarchal See from Saliq Qtispon to the new city of Baghdad. However, the great Church of Beth Kokheh retained its revered sanctity. Even though the Patriarchal See moved to the city of Baghdad in 780, the Church of Beth Kokheh retained its status as the place for the consecration of the Catholicos Patriarch. It also remained the venue for a number of Church Synods. Its holy grounds contained the graves of 24 Catholicoses, the first of whom was Mar Abris (121 – 137) and the last one was Mar Khnaneshoo II (774 – 779) in the year 779. The last Patriarch to be consecrated in the Great Church of Beth Kokheh was Mar Temateous II (1318 – 1328). In the year 2000 the Assyrian Church of the East conducted a church service in the approximate location of the Church of Kokheh, as part of the celebrations conducted by all of the Eastern Churches to welcome the third millennium of Christianity. Of the few ruins of the Saliq Qtispon which remain standing to this day is the Tak-i-Kisra, or Arch of Kisra (ancient Qtispon) at Salman Pak which is located approximately 25 kilometres to the south of the city of Baghdad. The shape of this historical arch has been incorporated into the logo of the magazine Church of Beth Kokheh as a symbol of the historic spot that Saliq Qtispon and Kokheh hold in the glorious history of the Assyrian Church of the East. The Concise Collection of Synodical Canons by Mar Audisho Bar Brikha – the handwritten Syriac edition. The History of the Syrian Church of the East – Volume One: during the era of the Sassanid Kings ܟܬܵܒ݂ܵܐ ܕܡܲܟ݂ܬܒ݂ܵܢܘܼܬ ܙܲܒ݂ܢܹ̈ܐ ܕܥܹܕܬܵܐ ܡܲܕܢܚܵܝܬܵܐ ܕܣܘܼܪ̈ܝܵܝܹܐ – ܒܲܡܕܲܒܪܵܢܘܼܬܵܐ ܕܩܵܬܘܿܠܝܼܩܹ̈ܐ ܕܲܣܠܝܼܩ ܘܲܩܛܝܼܣܦܘܿܢ – ܐܲܨܲܚܬܵܐ ܩܲܕܡܵܝܬܵܐ: ܒܕܵܪܹ̈ܐ ܕܫܘܼܠܛܵܢܵܐ ܕܡܲܠܟܹ̈ܐ ܣܲܣܲܢܵܝܹ̈ܐ – ܐܸܬܚܬܸܡ ܒܲܡܕܝܼܢ݇ܬܵܐ ܕܐܘܿܪܡܝܼ ܒܡܲܛܒܲܥܬܵܐ ܕܲܫܠܝܼܚܹ̈ܐ ܕܐܲܪܟܐܲܦܸܣܩܘܿܦܵܐ ܕܟܲܢܬܸܪܒܘܿܪܝܼ ܒܫܲܢ݇ܬܵܐ ܡܫܝܼܚܵܝܬܵܐ ܐܨܙ 1907. This volume was published in the vernacular Syriac in 1907 in Ormi by the Archbishop of Canterbury’s Assyrian Mission. (Al Siryan – The true name for the Arameans and Assyrians and Chaldeans – by Muwafaq Nisko, published by Bissan Bookshop in Beirut, Lebanon in 2012). Taken from Holy Bible, From Ancient Eastern Manuscripts, Containing the Old and New Testaments Translated from the Peshitta, The Authorised Bible of the Church of the East, by George M. Lamsa,– Published by A. J. Holman Company, Philadelphia USA 1967. The Peshitta (from the Syriac word ܦܫܝܼܛܬܵܐ which means simple, straight) is the Classical Syriac version of the Bible which was translated from the Hebrew in the 2nd Century AD. By the 5th century AD it became the standard bible among numerous divisions of the Syriac Christianity. Some New Testament scholars argue that Aramaic, which later became widely known as Syriac, was the original language in which portions of the New Testament were written (see Overview to Leiden Peshitta on the Logos Bible Software website). Young’s Bible Dictionary was published in 1984 by Tyndale House Publishers, Inc. Wheaton, Illinois USA. Its General Editor was Dr. G. Douglas Young, S.T.M., Ph.D Institute of Holy Land Studies, Jerusalem. See page 77 of Young’s Bible Dictionary. The ancient city of Seleucia (I have referred to it as ‘Saliq’ as most members of the Church of the East know it) was situated on the Western side of the river Tigris. It was modernised and expanded by Seleucus I Nicator, one of the Alexander the Great’s officers. He ruled over the Seleucid Empire from 311 BC to 280 BC. A few years later he moved his capital to Antioch in Syria, but Seleucia remained an important cultural and trade centre. During the third and second centuries BC, its fame matched that of Alexandria in Egypt and Antioch in Syria. The Acts of Mar Mari is a book which records the itinerary and preaching of Mar Mari in Mesopotamia until he reached Kokheh which ended up being the patriarchal seat of the Church of the East for many centuries. A copy of the book, which contains the Acts of Mar Mari in Syriac and a relevant account from Kitab al-Majdal in Arabic, both of which have been translated into English by Professor Amir Harrak (who was born and raised in Mosul, in the vicinity of Nineveh in Bet Nahrain and teaches at the University of Toronto, Canada) can be obtained on the internet. People within the Church of the East community often use the two names of Saliq and Qtispon joined together as ܣܵܠܝܼܩ ܘܲܩܛܝܼܣܦܘܿܢ (Saliq and Qtispon). The two cities are also referred to as ܡܕܝ̈ܢܵܬ̈ܐ ܩܵܬܘܿܠܝܼܩܝܼ (the cities forming the See of the Catholicos). A list of Parthian kings printed in the scholarly book The Cambridge History of Iran contains the name of a king called Artabanus IV of Parthia who ruled from 80 to 81 AD. This confirms that Mar Mari and his colleagues arrived in the region at around the same time. Qtispon or Ctesiphon was also already an ancient city at that time. Some biblical scholars and historians say that Qtispon was first mentioned in history in the Old Testament, Book of Ezra (Ezra 8:17) under the name Casiphia. The Book of Ezra was written sometime between 460 BC and 440 BC. The Armenians had the name ‘Tizbon’ for Qtispon. The classical Syriac word for singular Kokha is ܟܘܼܪܚܵܐ with the plural being ܟܘܼܪ̈ܚܹܐ. The present day town of Iznik situated in North West of Turkey. The city of Maipherqat was located in the Roman Empire between Syria and Armenia. Jean-Baptiste Chabot, a leading French Syriac scholar, published in 1902 in Paris a volume which included the proceedings of the first 13 Synods held by the Church of the East from the year 410 to 775, including the Synod of Mar Iskhaq held in 410 AD. The volume was titled Synodicon Orientale, copies of which can be obtained from various sources including Atour Publications. The volume is an important source of the history of the Church of the East during those early centuries of Christianity. Al Qadesiya is a historical city in southern Beth Nahrain located southwest of al-Hillah and al-Kūfah in Iraq. Rules enacted in accordance to the Islamic Sharia laws that applied to non-Muslims (referred to as the Al-Dhimma – people enjoying the protection, which referred mainly to Christians and Jews).